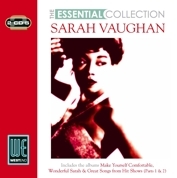 AVID Entertainment continues its series of Essential Collection releases with a wonderful collection of four classic albums from one of the great female vocalists Sarah Vaughan. Perhaps best known for her life long association with Billy Eckstine whom she performed with from the mid 1950s until the 1980s we have chosen four of her fabulous albums from the 1950s to highlight the versatility of this amazing vocalist. CD1 comprises  Make Yourself Comfortable and  Wonderful Sarah while CD2 offers a pleasing mix of the familiar and not so familiar with her classic albums Great Songs From The Hit Shows Part 1 & 2 featuring classic show tunes from 1916  1951. Here then is the  Divine One at the height of her powers and another classic release from AVID Entertainment!